Just as in family life, when it comes to church life it’s sometimes necessary to call a family meeting and have an open and honest conversation around the dinner table. Who are we? What are we about? And what do we need to adjust in our family dynamic? In church life that dynamic is about ministry. And whether we call our leaders “ministers,” “priests,” “bishops,” “deacons,” “pastors,” “teachers,” “preachers,” “elders,” “vicars,” “rectors,” “curates,” “reverends,” “servers,” “carers,” or simply “workers,” the impetus remains the same: At our best, we want a dynamic which grows the church towards maturity. The “family table” conversation means grasping for more than tired old formulae or the latest managerial gizmo. We commonly recognise that, whatever the nomenclature, we desire for God to be in us, with us, and through us, by the power and presence of his Holy Spirit. We might adhere to the traditional threefold order of deacons, priests, and bishops, and understood them as a variety of charisms – anointings of the Spirit through the laying on of hands. Or we might emphasise the more universally “lay” charismata (spiritual gifts) through which the people of faith operate as one body as “to each one the manifestation of the Spirit is given for the common good” . It was he (Jesus at his ascension) who gave some to be apostles, some to be prophets, some to be evangelists, and some to be pastors and teachers, to prepare God’s people for works of service, so that the body of Christ may be built up until we all reach unity in the faith and in the knowledge of the Son of God and become mature, attaining to the whole measure of the fullness of Christ. This dynamic involves the fivefold “offices” or “functions” of Apostles, Prophets, Evangelists, Pastors and Teachers, often abbreviated as APEST with Pastor renamed as Shepherd so as not to have two P’s. Unlike other biblical charismatic gift-lists (e.g. 1 Cor 12, Romans 12) these ascension gifts seem intended to form a more complete and coherent shape about our family dynamic. A simple first glance shows that there is room to explore this in practice. We know what it means for the church itself, and for members of the church to be pastoral. We can also grasp when the church and its members act in a teaching capacity, or exercise evangelism. But we are less able to grasp the prophetic and apostolic shape of church life. Or, to put it another way, as I have observed, the church loves and embraces Shepherding and Teaching, appreciates and values Evangelism, generally tolerates the Prophetic (especially if prophets hold back and keep to themselves), and unknowingly yearns for the exercise of the Apostolic. Emphasis on the fivefold has increased in recent times. Hirsch’s book is a worthy contribution, emphasising a holistic and systemic approach rather than a highly individualised pop-psychology. His motivation for a “great recalibration” (xxix) I share, and his yearning “for a new sense of wholeness that only an imaginative vision born… can provide” (xxi) definitely taps into the longings of the wider Western church. His recognition of how “the more dynamic APEST system has never suited the more static, hierarchical, fundamentally non-movemental form of the church that has dominated in the West” (xxxviii) is a frustration grounded in reality. The whole understanding, of course, rests upon Ephesians 4:1-16. Hirsch’s exegesis in the first chapter is more than adequate. In particular, his drawing out of the imagery of the triumph in the ascension makes a powerful point about Jesus gifting the church with (ideally) a regenerated and regenerative human community. Similarly his systemic approach to the fivefold is founded on the point and purpose of “attaining maturity and fullness in Christ” (p8). The corollary, of course, is that if there is an imbalance (or absence) in the operation of the fivefold gifts in the church, immaturity is the result (pp11-13). He integrates this into his robust missiology (p80ff), unveiling it’s place in how we the (Body of Christ) now share in the Ministry of Christ, this participation being the essence of the Fullness of Christ (p80ff). Hirsch does well to resist our individualising tendencies. It’s not until page 44 that he explicitly states that “it is quite conceivable that the fivefold could be used as a means to profiling personality and helping people live into their unique sense of identity as a follower of Christ.” The system and the symphony come first. What we have then, is a properly exhaustive, internally consistent, framework which naturally applies to personality and leadership, and which has strong threads that connect it with the range of human experience and our understanding of God. As he gets into the five APEST aspects themselves, Hirsch brings in a very useful distinction between what he calls “functions” and “callings” (p94). The distinction allows us to consider the fivefold, firstly, in terms of the church’s “innate purpose and functionality” and, secondly, in terms of individual calling or vocation. That is, we can speak of how the church, exercising the Ministry of Christ as the Body of Christ, to avoid dysfunction, needs to be, in a corporate sense, apostolic (A), prophetic (P), evangelistic (E), pastoral (S), and didactic (T). Any sense of individual calling is best seen as an expression of that, an outworking of the Ministry of Christ in one member of the Body of Christ. 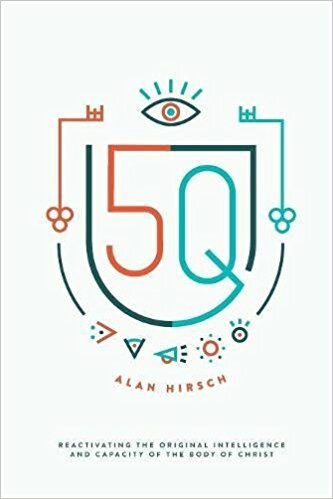 From my own discernment, I feel that Hirsch overemphasises the functional and entrepreneurial aspects of the apostolic (entrepreneurship attaches more to the Evangelistic in my experience) and he also overlaps with the Prophetic when it comes to the guarding of values. This is a common mis-step in fivefold literature, and can be avoided by looking just a little deeper. The apostolic is at the heart of movement but doesn’t usually generate it by being out in front, but primarily through covering and parenting. Come close to the apostolic and you find yourself connected in worship to the fathering heart of God, you find something kenotic, poured out for the sake of the body. Paul is a definitive example (e.g. 1 Cor 4:9 , 2 Tim 4:6 ). The confusion comes, because, in providing the covering, the apostolic will often lead with the shape of the other functions, so as to guide and bring movement in that area. Prophetic-Prophet (p102): Is rightly associated with the call to holistic worship, so that “as his people, we are to be the one place where God, and everything he stands for, is revered, cherished, and obeyed.” Hirsch usefully observes a “vertically” orientated prophetic that feels what God feels and brings about an encounter with him, and a “horizontally” orientated prophetic that calls people to covenant obligations of justice, holiness, right worship, and right living. It risks a false demarcation, but this properly recognises both the “mystical-charismatic” and “social justice” (p105) aspect of the prophetic. Unlike some commentators, Hirsch doesn’t avoid the hard aspects of the prophetic function and calling. “Prophets are often agitators for change” (p105), he says understatedly. In my experience, the most common dysfunction of otherwise healthy churches, even those who have a sense of apostolic mission and evangelistic zeal is that they ignore or reject the prophetic. They end up forgetting even the elementary teachings about Christ (Hebrews 6:1) and become a self-referential self-absorbed shadow of who they are called to be. Evangelistic-Evangelist (p106): Hirsch does well to move the understanding of evangelist beyond the Billy Graham caricature. Yes, evangelism is about communication and “getting the message out” but it’s also about “the infectious sharing of the movement’s core message” and “the demonstration of good news in word, sign, and deed” (p107). An interesting thought that Hirsch mentions – one that I will need to dwell on more – is to consider a priestliness in the evangelistic calling. “They have a capacity to make connections with people in a way that demonstrates social as well as emotional intelligence… their function is genuinely priestly in that they mediate between God and people as well as between people and people.” (p108). Shepherding-Shepherd (p108): The pastoral shepherding image is common in Scripture and Hirsch draws upon it to demonstrate a function and calling that emphasises “social connectivity”, healing and protection. They “champion inclusion and embrace” and desire formation in disciples-making that “lives locally and communally” (p110). The use of “shepherd” instead of “pastor” is not just about having a better acrostic at this point. “Pastor” has become an honorific, the stuff of name plaques on office doors. “Shepherd” re-engages with the necessary empathy and sharing of life that “knows the personal details of the particular people in one’s orbit” (p111). All of the functions bring pain when they are done distantly and dispassionately, but shepherding that is merely theoretical and formulaic, or done without any self-giving, is the harshest dysfunction. Teaching-Teacher (p111): This function is also commonly understood. Hirsch draws us to the rabbinical tradition and the Wisdom Literature of the Scriptures to describe it. The emphasis here is not just on the heady and intellectual love of the abstract truth (the development of a “biblical mind” that means “seeing the world as God sees it, as described in the Scriptures”) but also on the application in real life. All this is substantial…. But what to do with it? The point of typologies and inventories is to consider and address imbalances, strengthen weaknesses, and avoid the “precociousness” of over-reliance on strengths (p118). It takes maturity to do this, and sometimes maturation is not popular; “asymmetrical churches always end up attracting people who are like-minded and therefore asymmetrical… witness the many one-dimensional charismatic/vertical prophetic movements of the last century… or the asymmetrical mega-church that markets religion and ends up producing consumptive, dependent, underdeveloped, cultural Christians with an exaggerated sense of entitlement.” (p119). Hirsch’s bold response is to suggest a re-evaluation, almost a reconstitution, of our ecclesiology that is based on the fivefold as the “marks of the church.” (p132). This is bold. Not only does this counter the ST imbalance of the “protestant marks” of “word and sacrament” (p130), but even challenges the “one, holy, catholic, and apostolic” marks of the Nicence Creed! I’m not sure I’d go that far, and I think Hirsch’s is over-universalising the fivefold at this point. What is needed is not a reconstitution, but a reinvigoration, a substantiation of what we say and pretend we are into who we actually are. For instance, I am currently working on some thoughts about how we have placed professionalism at odds with our vocationalism. If we could be a church that actually values and practises vocation (an inherently apostolic function that the church is literally crying out for) rather than just stealing the word for our own mechanics, then we will have reinvigorated something and addressed an imbalance. But more of that another time. Nevertheless, the point is well made. Organisations as much as individuals need discipling (p147), and the fivefold framework is a useful world of challenge and comfort in which to do that. It can even be a framework in which to make use of and respond to various tools for ecclesial self-reflection (NCD springs to mind) as well as the various tools and techniques that Hirsch hints at in the latter part of the book. But it takes more than a brand, even a 5Q brand, it takes a brokenness, a contrition, a willingness to be led by the Holy Spirit through hard places. The Western church has a perverse resistance to such things. My hope is that contributions such as Hirsch’s will not be quickly swallowed up as yet another branded technique to exploit for our own ecclesial self-gratification. It has enough substance, enough comfort and challenge, to avoid the pitfalls. Wise leaders will read, mark, inwardly digest, and apply. 1) I don’t often comment on the tone of a book, and it may play well in America, but there are times when Hirsch comes across with an air of arrogance that brought me to the brink of putting the book down. It has stopped me from pushing the book forwards in some contexts where I would like to promote fivefold thinking, because, frankly, the tone would undermine the case. Alan, you are not my Yoda, I am not your padawan (xxiiff, p7, p23, p80, etc. etc. ), and you are not bringing forth some hidden ancient “world-renewing energy” (p31) that you have been personally bequeathed (p89) or have discovered (xxiii, p27 etc. etc.) like some great white Luther-like Indiana Jones who “blows his own mind” (p29). You are making a worthy contribution amongst many worthy contributions. Get over yourself, son. 2) The book is theological in the sense that it interacts with the fivefold as more than just a personality typology. But Hirsch’s theology, in terms of the discipline, is not great. I agree with many of the conclusions, but the arguments are not convincing. Particularly this: Hirsch wants to show that the fivefold demarcations are not some arbitrary overlay but are inherent not only within the created order but within the character and operation of God. It’s a worthy hypothesis, however, condensed down, his argument proceeds as follows: 1) State what the fivefold demarcations look like in practice; 2) Observe these practices in creation (archetypes, p35, p63ff) and divinity (p55ff especially); 3) Conclude that the fivefold is therefore a derivation of something essential. This is fallacious, I could also argue: 1) My fruit lollies have different colours and related flavours; 2) I observe these colours in the physical world, and symbolically throughout history; 3) My fruit lollies are therefore full of inherent meaning. Don’t get me wrong, I do think the fivefold typology coheres with the wider sense of how personality, community, and divinity operate. I was hoping for some robust theology to help me out. Hirsch’s observation is useful, but some derivation is needed, e.g. demonstrate how fivefold functions are a necessary outworking of God as Trinity. At the very least, begin with Biblical examples of the fivefold offices, and derive the typology from that. e.g. Hirsch wants to show that Jesus is the perfect embodiment of the fivefold gifts But he describes it this way: “The fivefold typology is therefore not incidental to Christology but indelibly shapes it and gives it content” (p21, see also p78). No! To be meaningful, it should be that Christology is not incidental to the fivefold typology, but indelibly shapes it. Derive from Jesus, not to him! “Jesus cannot be understood apart from all fivefold identities” (p79) is simply an incorrect statement. I can also understand him as Son of God, as Prophet, Priest and King, as Advocate, as Lamb of God, as the Word/Logos etc. etc. 3) I am always wary of books that attach to products. 5Q is a brand name with a business model. This is not a unique problem – PMC is the same – and I understand why it happens. But the higher road is this: if you want to push along a movement, or have something profound and biblical to say, then put out the base theological material generically, and then you and any other person can use it to help and assist, consult and guide, and so build the body of Christ (towards Ephesians 4 maturity even!). Otherwise it looks like you are monetising truth, and God’s truth at that. Around the family table, though, as we wrestle with our church family dynamic, the fivefold discussion needs to happen. 5Q gives us something to talk about, and, if we have the courage, to do. Review: 5Q – Reactivating the Original Intelligence and Capacity of the Body of Christ by Will Briggs is licensed under a Creative Commons Attribution-NonCommercial-ShareAlike 4.0 International License.